Those ears can harbor dirt and parasites if not cleaned. While a little brown wax is normal in your kitty's ears, an excess of it isn't and may also be accompanied by an unpleasant odor. If you notice lots of brown wax in your kitty's ears, visit the vet to have them cleaned and treated. 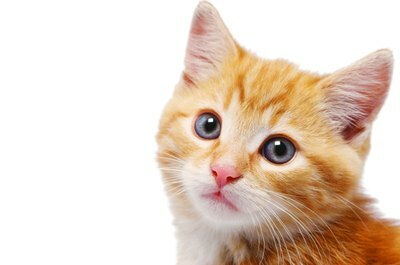 Your kitty's ear wax, also called cerumen, is naturally brown in color. When it builds up in the ears, it can appear to be dirt or dried blood. A kitty naturally produces a little wax, but those with systemic inflammation from allergies can start producing more ear wax than usual, according to the All Feline Animal Hospital. Other causes of brown wax buildup in your furry friend's ears include parasites like mites or infections caused by yeast or bacteria. Unfortunately, the wax buildup itself can lead to secondary infections forming, resulting in two problems to deal with. Not only does this wax look and smell bad, it can cause irritation and discomfort for your furry buddy. Brown waxy buildup in your kitty's ears should be examined by a veterinarian to determine the cause. She also needs to check for any signs of a secondary infection that might have formed. Your vet will look into your kitty's ears with an instrument called an otoscope to examine his ear canal. She may also do some blood tests to determine if an underlying illness is present, such as an autoimmune disease, diabetes or hypothyroidism, all of which can cause ear infections and waxy buildup, according to WebMD. Depending on what the diagnosis is, you'll likely have to give your kitty ear drops or oral medications like antibiotics to treat any infections. After examining your kitty and determining the cause of his waxy buildup, your vet will probably clean the ears out and recommend an ear cleaner for you to use to keep them free of debris. Never stick anything in your kitty's ears, like cotton swabs, to clean them. Simply put a few drops of cleaner into the ear, rub the base of the ear with your thumb and gently wipe the cleaner from the outside of the ear canal with a cotton ball. Administer any prescription ear drops as directed by your vet. These drops may contain antibiotics, insecticides, anti-fungals or anti-inflammatory ingredients to help your kitty feel better. Regular cleaning and administration of any medications should relieve any itching, pain or irritation your furry friend is experiencing. Inspect your furkid's ears regularly to check for any brown, waxy buildup. Clean them with a bit of pet ear cleaning solution, found in pet supply stores, if you see any minor signs of brown wax. Keep your furry friend indoors to reduce the chances of him contracting parasites like fleas or mites that can cause ear issues. If your kitty is experiencing allergies, either his food or a chemical in his environment could be to blame. Your vet will perform allergy tests on him if she finds no signs of illness, infection or external parasites. She may recommend you try a hypoallergenic diet for several weeks to see if that clears up the problem.